The strength of the interaction of a plasmonic nanostructure with any electromagnetic field depends on the number of optical excitations that it can support in a given spectral range. Thus the plasmonic properties of a metallic structure can be fully described by its Local Density Of States of Surface Plasmons, SP-LDOS . Recently, we have developed several techniques to tailor the SP-LDOS of colloidal plasmonic systems deposited at the surface of insulating materials. Moreover, a number of experimental optical (SNOM, TPL, ...) and electron beam (EELS) methods are now able to quantify and image this fundamental quantity. The electron density waves associated with surface plasmons can be tailored by a careful design of individual metallic nanostructures. Depending upon the particle morphology, a variety of higher order SP modes, similar to Fabry-Perot or whispering gallery modes in optical cavities, have been obtained. These investigations have demonstrated that colloidal chemistry is better performing than standard lithography techniques for the fabrication of single crystalline metallic nanostructures. In particular, the reduced dissipation due to intrinsic losses in the material and the sharp geometries defined by the crystallographic facets favours a better build-up of SP modes. Figure 1 : (a)–(c) SEM images of triangular, truncated triangular, and hexagonal gold nanoplatelets. (d)–(i) Corresponding TPL maps acquired with a wavelength of 700 nm and linear polarization of 0 deg (d)–(f) and 90deg (g)–(i), as indicated by the white bars in the upper right corners. (j)–(o) Corresponding simulated maps. Scale bars are 200 nm. Adapted from Appl. Phys. Lett. 103, 131112 (2013). 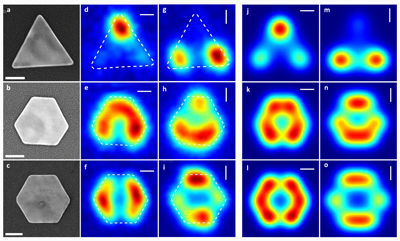 In this study, in collaboration with A. Arbouet (nMat group, CEMES), we have used two-photon luminescence (TPL) microscopy to investigate the influence of the particle morphology on the SP modes of planar plasmonic nanostructures prepared by an original bottom-up nanofabrication technique. 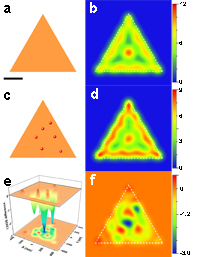 The spatial distribution of the plasmon modes is monitored and compared to numerical simulations based on the Green dyadic method as the particle in-plane shape undergoes a symmetry transition, from triangular (C3v) to hexagonal shape (C6v). In addition, for a given geometry, TPL maps are recorded for different combinations of wavelength, incident light polarization, and nanostructure size. 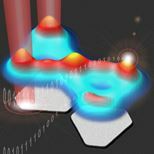 Building nanostructures from individual atoms or molecules confines two-dimensional surface electronic states into closed resonators or “quantum corrals,” which are directly imaged by scanning tunnelling microscopy (STM). In 2002, an optical analogue was demonstrated with surface photonic states confined inside optical corrals made of gold pads on a transparent substrate. Very recently, we have shown that plasmonic nanoparticle networks (PNN) made of adjacent or fused individual gold beads permit to enter the deep sub-wavelength range and lead to a real sub-wavelength patterning of the SP-LDOS, revealing then new photonic properties for nanoscale optics developments. Proteins showing specific recognition for a chosen crystalline metallic gold surfacewere used to drive the self-assembly of the colloids onto the surface of single crystalline gold platelets as a first step toward programmable protein-driven construction of complex plasmonic architectures. Simulations by the Green Dyadic Method suggest that the antibody-driven assembly demonstrated in this work could be exploited to significantly modify the SP-LDOS of the gold platelets. Our work shows that molecular biology tools can be used to design plasmonic hybrid nanomaterials.